I was going to post the "Camera of the Year" post after Peter's essay, but then I got an email from a friend who said, "So now that you've posted the second of the Peter Turnley posts, you plan to follow up with one about the Camera of the Year for 2009? How much more crass can you possibly be?" Followed by a smiley face. But still. So I'm going to hold that off a little longer. In the meantime, an ironic counterpoint to Peter's essay: Eolake alerted me to the fact that the BJoP linked to a Wall Street Journal list of the best and worst jobs, and, on the list, "photojournalist" placed 189th out of 200. That's right: only 11 jobs are worse than "photojournalist." Did Peter's life really sound all that bad to you? Of course, not every photojournalist is Peter Turnley. One of the factors they considered was "stress"—I'm sure with low stress being considered desirable. (The top job according to the WSJ is "actuary," and one of Eolake's commenters mentioned the old joke about that: "An actuary is somebody who used to be an accountant but couldn't stand all the excitement.") Imagine somebody popping into your office every few days and firing a few rounds off at random, and you'll get an idea of some of the stresses of being a photojournalist. So, yeah, there's that. On the other hand, I don't know how the Wall Street Journal came up with some of its numbers. As I said on Eolake's blog, how is $69,000 considered "top level salary" for an actor? What job is that—putting on tights and a jerkin while passing out "ale" at Medieval Village, addressing everybody as "milord" and "milady"? Being the fake interviewer on infomercials about colon purging elixirs? The top actor this year (she's a she, which used to be called an actress, but now that appears to be optional) is a woman called Sandra Bullock. To show you just how up with the times I am, I have not only never seen Sandra Bullock in a single movie, but I have never even heard of any of her movies—I looked them all up on imdb.com. But despite that, I'm going to climb out on a limb and guess that she earned more than $69,000 last year. Left fielder Willie Harris at work. Photo by Audrey C. Tiernan. The skills required for the job are very rare. You only have to work half the year. When you do have to work, it only lasts a couple of hours. True, you have to train; into every life a little rain must fall. You get to be outside. But you get to come in when it rains for real. The payscale is through the roof. If the team isn't contending, your mistakes won't cost your team much, so presumably your stress level is on the low side. The people who have the two best jobs in the world in my opinion are Vanna White and Dan Castellaneta. Vanna started out turning over the letters on a word-game show called "Wheel of Fortune." For years on the show, she didn't even talk. She just walked back and forth and flipped letters. And then they made her job easier. They went to electronic screens, so technically she's not needed at all any more, but by that time people liked watching her (she is still easy on the eyes, being one of those humans who apparently do not age; she was born seven days before I was, but unfortunately I do not have a portrait of myself in the attic which shows me growing older) so now she just touches the letters, and they change. Actually, what Vanna does for a living is clap. She claps after everything that happens. An average of 720 times per show (I looked it up, and no, I do not want the job of whoever had to count). She doesn't reveal her salary, but NEWSWEEK reported that she earns three to five million dollars a year "from all her endeavors." I should endeavor to have such endeavors. And Dan Castellaneta? He's the voice of Homer Simpson on the animated cartoon show "The Simpsons." He gets paid millions too...for talking. Granted, he's very, very good at doing voices, but still...that is one great job! I'd pay just t0 be able to do the Homer voice. It's really all in the way you look at it, though. The worst job I ever had was when I briefly worked as a check-out clerk in the Express Lane at a grocery store way back in the '70s, in between exhausting stints of college. It was unrelenting, but I was so bored an eighth of my original brain cells died from atrophy. Fortunately, I only had to do the job for three weeks, until the store's regular Express Lane clerk, by the infinite grace of our dear merciful God, returned from vacation. Her name was Jean, and she considered her job ideal. She got a good wage (with time and a half on Sundays), she didn't have to do any thinking (she actually said that to me, in so many words), and she got to visit with customers, many of whom she considered friends. She loved it. She'd been doing it for thirty years. I'd hang myself with a rope. The worst job I can imagine: sandwich man. I feel a deep pity whenever I see one of those guys. If you think about it, a sandwich man is only slightly more valuable to society than a post. A post is stronger and doesn't ever need a rest; but it cannot move, whereas a sandwich man can amble back and forth—presumably morosely, as he sinks ever deeper into a black swamp of despond. Museum guards are probably just as bored, but at least they get to look at art. But last summer, I spoke to a kid who was walking up and down in front of our local pizza shop with two big signs hung on his shoulders. I probably said something meant to be comforting, but he ended up telling me that he thought it was just the best job. "I get to be outside all the time," he gushed, "and I don't have to actually do anything, and I get paid, and I get free pizza, too!" This last he said in a tone of voice like it was just too much for him to contain, it made him so happy. He had the world by the tail, that kid. So it's all in how you look at it. As Paul McCann says, "Find a job you like doing and you'll never have to work." I'll bet to some people, even being a photojournalist isn't half bad. Featured Comment by Kirk Tuck: "Hmmm. If I could do any job I would take a time machine back to 1985 and be an advertising photographer. Great pay, technical expertise and experience required, medium to low stress. Regular stream of work. Worst job? Advertising photographer in 2009. Stress from not working. Upside? Lots of free time. And I mean 'free' time. Aspiration? I want to be the guy who sweeps up the small denomination bills that fall on the floor at Goldman Sachs." Featured Comment by K Brown: "I was a security guard at the art gallery in Victoria, and I can say without question, the sandwich board guy has it much better. In the museum, nothing ever changes...for months at a time. You learn to truly hate those artists you see day after day after day. Ah, the life of the sandwich board guy, how I envy him." Featured Comment by Marty S: "I had a summer job as an art museum security guard for two consecutive summers during college and I thought it was a great job. Fortunately, it was a small museum, and often wasn't very busy. It was the former home of a wealthy art collecting couple converted into a museum after their death. They had an extensive library of art books (including several photography books) and I spent a fair amount of time just reading. Between reading many of the books and talking to the director and assistant director, I learned a fair amount about art. Definitely more interesting than wearing a sandwich board." Featured Comment by Fmacgregor: "I feel I should jump to the defence of the actuary—I spent many a (relatively) happy summer working in an actuarial department. As far as I could tell no one, at all, understood what the actuaries did, but their word was law, and even the loudest, brashest city boys listened to them and did what they were told. It may not be glamourous, but people listened to, and respected, you. And if you had a masters degree, then your business card could have "MAFIA" at the end of it, which I think should count for something. "How do you know you're talking to an extroverted actuary? He stares at your shoes when he talks to you...."
Featured Comment by Jim Hart: "Mike, I've had a job where I was paid to be shot at (flying right seat in OV1 Mohawks with the U.S. Army in Vietnam). It ranks as the best and worst job I've ever had. Trust me, you'd rather work in the medical record field. My most confusing job was when I was self employed; I'd only pay me what I'm worth, and I won't work for that." Featured Comment by Carl Dahlke: "I had a job that really put me off of commercial meat for years. I was working at a ham factory, where the hams would be dropped on the floor, kicked around, and used as footballs in the continuing ham football game before they were shrink wrapped. Once the boss came around and asked the workers to not use the hams as sports equipment for a couple of days because he had found out that a meat inspector would be coming around. "I think the worst work is grindingly hard physical labor which I have only done a few times for short stretches (think carrying a 100 pound sack of potatoes about 15 feet from a loading dock to a potato bagging machine every 20 seconds for 8 hours). There is nothing left of you to live life if the work is physically hard enough. "The best job is being part of an exciting enterprise that is doing something bigger than just making money. I worked as a database designer for a company that was sequencing the human genome and for a few years I was racing to work every day to put in 10 to 12 hours. I was helping to make scientific history happen in the company of many very smart people. Just about any job is just going to be a job after that kind of excitement." A sandwich man is only slightly more valuable to society than a post? Actually, I find your post quite enjoyable. Depends on how you look at it. I think Yeardley Smith's job has to be better than Dan Castellaneta's. Dan not only does the voice for Homer but also a bunch of others (Grandpa, Krusty, etc.) and Homer has a significant part in just about every episode. Yeardley Smith gets paid the same amount to just do Lisa Simpson, who often has just bit parts. In my working life I've gone from #44 up to #34, then back down to #96 - what kind of career progression is that? However I see they don't list "retired, and living in the countryside" - if it weren't for the income level, that would be #1! "[A] sandwich man is only slightly more valuable to society than a poet." And as for Sandwich Man, wouldn't it have been cool if he had drilled a hole in that sign big enough to fit the lens of a camera? We might even have a companion photo of Thurston Hopkins in action, then. Enough with the suspense ! Give us the COTY post. I can't avoid thinking that this topic might be uncomfortable to those readers who might be at a point where they'd take any job, good or bad. But in good humor and with good wishes I'll join in. The most menial job I ever had was cleaning grills and grease traps at a burger joint across the street from my high school. It was disgusting...although I learned that there's gold in grease (or at least value) as it's collected and sold. But looking back I wouldn't label it the worst job I ever had. In fact, it was far from it. That title would go to a pretty high-paying and unique position I landed just after college. The good news, like being a "sandwich board" walker, it kept me mostly out of an office and away from small-world office politics. The bad news was that it kept me on the road almost continuously (rather like George Clooney's character in "Up in the Air") and, worse, having to give very structured, very technical seminars to rooms full of highly educated men much older than me and with much more practical experience in their field than I would ever (want to) have. I eventually learned to manage the stress -- "I know something you don't know...and you're paying dearly to hear it." --- but the travel eventually wore me down...I couldn't stand it any longer after a few years. But you're right, Mike. It is all a matter of perspective. I'd be sitting on a plane on a Sunday evening heading to someplace I didn't want to go, and be chatting with some middle-aged salesman terrified that he wouldn't make quota that year and lose his job, and them be faced with staying home with a family that he really didn't know or even like. Perspective. To readers suffering from job loss, I can only wish you the best of luck and strength. It ranks "historian" as #5—but there's an old joke about that too: "The only jobs out there for old historians is training young ones." I agree on the sandwich board guys, but I can do you one better - either the guys who have to wear a Statue of Liberty outfit while advertising a tax company (I forget the name), or the ones who hold the signs pointing to new real estate developments (though these days I don't see too many of those). The top-paid one-hundredth of one percent of any job is going to be good. The bottom one-hundredth of one percent is also going to be pretty bad. 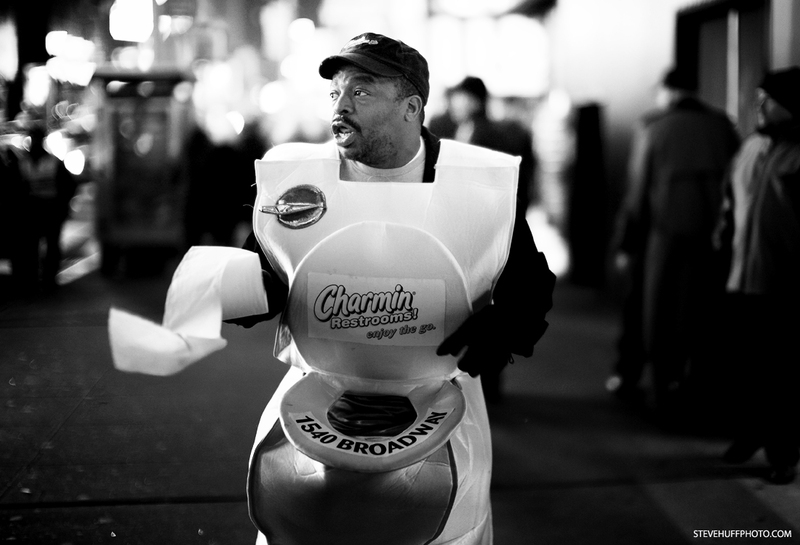 Your sandwich board guy is in advertising; how much does the top guy in US advertising make? Sandra Bullock is not the top one percent of actors, or even the top one-hundreth of one percent, she's probably more like the top one-thousandth of one percent. Every time you turn on your TV, and it's anything but a cartoon, you're looking at actors (even news people; even sports guys.) There are tens of thousands of them. A beginning on-air reporter at some smaller TV stations in the US makes $25,000...a network anchor makes millions. When I'm out peddling a book, the publishing company hires a car to take me around to bookstores to sign books -- that way, I can hit a lot more stores in a day. I was once driven around by an actor, who was in a commercial that was actually pretty famous (he was one of the fruits in the Fruit of the Loom commercial.) This guy was really pretty good...and he's driving a limo during the day. I bet if you looked it up, the average actor in the US makes, from acting, considerably less than the average carpenter (and, of course, the average carpenter's work is more valuable). I don't so much care about the disparity in pay rates -- there are outliers on anything -- as I care about the *existence* of some of these jobs. A sandwich board man means, to me, that we are in a Depression, or something like it. This is a job that is shuffled off on people who otherwise would be reduced to begging. Here in California, you see guys all over the place, usually spinning arrows or other signs, to direct people to new apartments -- in other words, a new flavor of sandwich-board man.Want a worse job? There are guys whose job is to drive round in rush-hour traffic, with billboards on the back of their pickups or flat-bed trucks. And there are quite a lot of guys, here, who are professional beggars. I really never thought I'd see that in the US -- when I was a kid, you'd read about the beggars of India or Egypt, but professional begging was almost unthinkable here in the US, in the Fifties. I think Yeardley Smith has a better job. She only does the voice of Lisa Simpson (all other regular cast memebers on the show do multiple voices) and AFAIK, the Simpsons cast negotiated collectively with most-favored-nation clauses in their contracts. They get paid tons, sure, but they also generate obscene amounts of money for Newscorp. Rupert Murdoch isn't going hungry due to what those actors get paid. For a good example of Dan Castelaneta's acting, check him out in the movie The War of the Roses. In the framing story of the movie, a divorce attorney played by Danny Devito is explaining to his prospective client (DC) about the titular divorce in flashback. Dan's preformance is done in pantomime; it is a non-speaking part. That $69K figure for actors is probably due to the fact that almost no actors earn money in their chosen field. Probably similar if you compared the profession 'actor' to 'photographer' and didn't break down into specializations. "I can't avoid thinking that this topic might be uncomfortable to those readers who might be at a point where they'd take any job, good or bad"
I've had my share of crummy jobs. Maybe I should have mentioned that. Last summer, Zander and I came to a decision related to the present hard times. Normally, I would demand that a 16-year-old get a summer job, so he could start earning his own spending money and learning how to be responsible. But then I heard from a neighbor about an article she had read in the local paper, about adult men and women who were taking summer jobs normally filled by teenagers because they had to in order to feed their families. I don't make a huge amount of money by any stretch, but I decided that I make enough to keep my kind in spending money for the summer, and it would be better for the community if he didn't take up one of the jobs that might be needed by an adult in bad straits. It was a strange decision--I let him live the life of leisure as a response to the community experiencing hardship. Doesn't seem to make sense on the face of it. I hope it was the right decision. I guess he'll have to learn to work soon enough anyway. I cannot speak to all of the jobs, but I will agree with the last one: a roustabout (in the sense of oil/gas rig laborer) is as hard as it gets. Lots of dangerous machines, long hours with no breaks, and happy days, you are covered in diesel fuel all that time (they use diesel to create the mud that gets pumped down the drilling stem and out the bit.) I did this as a summer job just before going to college, and we even received extra pay for new clothes because the diesel also dissolved the clothes as well. After that stint, I had a whole new appreciation for my education. As for the historian ranking (speaking from experience as one myself), it is not uncommon for those who do not go into academia to get jobs at places like WSJ where they create lists like "the best and worst jobs." The best and worst jobs are obviously civilian in nature as I can think of a few military positions having far more stress and less pay than anything on that list. After all, there is a big difference between getting figuratively shot at and getting shot at for real. It is something I sometimes ponder when I feel my cushy civilian job is stressful. Mike, this post was so funny I couldn't care less what the TOP camera of the year is. It's probably some auto-focus digital thing I couldn't care less about too. I also feel pity for the sandwich board people because here in my area of North Carolina when stores are going out of business and liquidating they will hire a homeless person to hold a sandwich board or a picket sign announcing the liquidation. Sure, it's nice that the homeless person is getting money for doing work but it just seems so humiliating to me to stand at a busy street corner holding a big sign with loud, florescent colors on it. At my 10 year high school reunion, someone who I would consider near genius level said his job was to find homeless people to hold liquidation signs. He was always telling crazy stories so I don't know if he was telling the truth. Where would that rate on the best jobs list? And where would my job list? I feel I'm wasting my intelligence as much as that guy: I make good money but I usually have about 10 hours of work to do in a 40 hour work week. My overactive mind can't handle not having something to occupy my thoughts and it just feeds my depression. So for everyone who thinks you want a job with nothing much to do- trust me, you really don't! Great piece Mike. Insightful, clever and amusing writing. Dare I say very Bill Bryson like? Now there's a job I'd say you'd be good at... he could well afford a ghost writer or three! I have to be careful here - if I get too gushy your legendary modesty will have my comments sidelined! Is landlord on that list by the way? I suspect its terminally low on the list given my experience with all the dysfunctional, disingenuous dingbats I've dealt with over the years. "Aspiration? I want to be the guy who sweeps up the small denomination bills that fall on the floor at Goldman Sachs." True story: I read in the NYT about a fellow who swept floors at OTB in the city. He went through all the discarded tickets, and made himself quite wealthy. Google it. As a relatively old Brit historian, I have to tell you that your comments have made me seriously consider re-hiring Hessians and sending them to your corner of the US tundra. But then I realised that Wisconsin is probably punishment enough. The worst job to me would be selling things-or, what I call 'peddling'. Add a deadline, and you've got not just stress, but pointless stress. Also, I had no idea that Willie Harris was still in baseball. I guess left field for the Nationals is barely in baseball. Under the best of circumstances, we in the states still live to work as opposed to say- "Western" Europe, where they generally work to live. Totally different mindset. It doesn't take a genius to see that we're living under a very failed economic system. On any given day you can see our jobs coming back to us under the Golden Gate Bridge on giant container ships straight from China. Giant ships selling us what once was our working, thriving middle class--our very backbone. "photojournalist" placed 189th out of 200. That's right: only 11 jobs are worse than "photojournalist." It's 189th out of the 200 listed. But there are many more jobs not listed. So there would be more than 11 jobs that are worst than "photojournalist". At any rate, I think the best job is the one you enjoy doing the most. In 1985 all the advertising photographers were bitching about how they missed out on the 1960s. Get two of them in a bar and it could go on for hours. I grew up working on a farm, and then moved 3000 miles away from the farm. I discovered recently that farmers and ranchers are about twice as likely to die on the job as policemen, which sounds about right from my experiences. I was in the software industry for a few years and got laid off and the "outplacement" company tested me and said I should get a job going around to companies that were doing layoffs and fire people. Sort of like the George Cloony character in that up in the air movie ( haven't seen it myself ). No idea why and I don't want to know, but they were shocked that I thought that would be the worst job in the world. Everything is relative, it might depend on the exact sandwich-man job. No, an actuary is an accountant with dyslexia. Didn't hear any mention of job fulfillment in the o.p. "Find a job you like doing and you'll never have to work" probably describes a lot of photographers. As for the sandwich man. I've had hard times and can tell you when times are hard a lot of self respect goes out the window, no trouble. Just delighted to be earning a few bob especially when one has a family. Mike, did you notice number 93, photographic process worker? Given the salary, I'd guess it's the person who takes the memory cards and CDs people bring into a shop and "creates" printed photos. IE, presses 'Print'. Euwwwww. Incidentally, we are in the last throes of a presidential campaign over here. (Yay! It will be over tomorrow!) One candidate is the current mayor* of Zagreb and a lifelong aparatchik turned 'independent'. The other is a law professor and composer. The first one said that he had been working all of his life, while his opponent was "only a professor". How about that for a job appreciation? There was also "photographer" at #126. And "corporate executive (senior)" was at #133. Both were below "nurse's aide" which I think is not one of most stressful and physically demanding jobs. What was surprising was "philosopher" at #11. Top salary at $105,000, not bad. In my teens, I did some work in jobs #197 and #199, I wouldn't put them to the end of the list. Aside from my current Job I've only ever done manual work. I've dug the roads, worked in factory's, cleaned floors. I'd say most everybody I know has always lived with a credit crunch. It's never been easy to keep an unskilled job as you're easily replaced. I have three brothers and three sisters and only three out of the seven of use are currently employed. But it was like that before this current credit crisis and it will be like that when it's over for many people. What a lot of people are experiencing now is how it has been for those from a lower socio economic group, for years. It's really only when this starts happening to people with a bigger stake in society that it makes the news. interesting photography..great timing and the subject you choose to photograph is appreciable..would like to know about the iso of the 1st image.. The best job I've ever had was succeding at surviving without having a job. The worst job was all the jobs I've ever had. Seriously. As far as I could understand the rather sketchy description of the methodology behind the WSJ list, contact with the public and working out of doors are both always negative factors in the ranking, despite the fact that these are actually quite popular for many people. Software Engineer and Systems Analyst jobs as #2 and #3? Half the people I know in those fields seem to be out of work these days. And yeah, Sandra Bullock makes something like $15 to $20 Million per film. If you and Zander find the same job situation next summer, perhaps you could ask that he find a volunteer job in the community, maybe even one that you make up yourself. He does some work for his money, you don't take a paying job away from anyone, and the community benefits from another pair of hands. I'm weird, I guess: I don't much care what the job requires doing so long as the people I have to work with don't irritate me too much. For instance, my first "real" job was cleaning up in a slaughterhouse after school. Granted, coming to work and facing forty or fifty 80-gallon plastic barrels that had been sitting out in the sun all day with offal in them and now needed scrubbing with acid wasn't exactly fun, but it really didn't bother me and I used up all my disgust for the rest of my life. (I changed all the poopy diapers when my daughter was small. I was like "Pfft, baby poop. Big deal.") But when I had to come in on Saturdays and help make breaded tenderloins with the boss (who was a nice man but obsessed with making breaded tenderloins FAST!) looking over my shoulder and the other people blathering about nonsense, that I hated. Probably the best job I ever had was working in a bank drive-through. For most of the day it was dead, but you couldn't leave your post to do scut work so I sat there and read. When it was busy, it didn't matter, because I could only see one customer at a time so there wasn't any pressure. If the line got too long people just went inside. I think many people would have gone out of their minds with boredom but I loved it. What shocked me was hearing what new airline pilots earn. If they start on the feeder routes in F-27's (or whatever the equivalent is today) it's only around 30K / year! Good grief, what do new Grayhound drivers make? Bet it's not too far off that figure. The most fun job I've had was working at Altmans, a large camera store in Chicago in the early 70's. I loved helping customers have fun with their cameras and also coming up with solutions to oddball equipment related requests. I could not wait to come to work each day. But life is a matter of circumstances and oportunities and you will never know how the results will be until you get in there and play. I have an education in journalism, fifteen-ish years of experience working in and around photography, photojournalist and lab rat. While I wait to find out if I'm accepted to the Radiologic Technology program at our local tech college I've decided to to take a job as a corrections officer. I start on Monday. The bills will continue to arrive with annoying regularity. btw...I didn't read the WSJ article...but I bet Mr.Stobblehouse's job ranks pretty high and the job satisfaction scale, yeah? You hiring, Eolake? I've been told I push a mean mop. Well when I was at university I worked as a medical records officer and I enjoyed it, the people I worked with were great. This often makes or breaks any job and working in the free at point of delivery National Health Service in the UK felt pretty good. The job had its boring side, but when records went missing I loved the detective work needed to find them. We also had what we called the "Nightmare of the living Dead" when a set of notes had been consigned to the "dead stack" and the patient then reappeared alive in Accident and Emergency. That always took some sorting out which I enjoyed, picking through the record trail to find out what had happened. As for being a photographer I'll stick to the amateur side. JonA: "My overactive mind can't handle not having something to occupy my thoughts and it just feeds my depression. So for everyone who thinks you want a job with nothing much to do- trust me, you really don't!" The other "old" joke is the definition of an auditor - an accountant who has had their sense of humour surgically removed. Also, "Teacher's Aide" ranks higher than "Teacher"!! How's that exactly?!? I've been both a teacher's aide and a teacher, and there's no question which one is the better job. My brother is an actuary, so I sent him the link, and I laughed at the jokes here about his job. Of course, he tells the same jokes with 'actuary' and 'accountant' transposed. Either job would send me insane. The best job is one which you enjoy so much that it doesn't seem like work at all. Of course, that's different for everyone. Isn't it wonderful how well expressed ideas can create images and how well created images can express ideas? I appreciate the many gifts you've shared with us. Thank you, Mike. Well, being placed only one position short of the fire fighters doesn't look that bad to me for a photo journalist. It may not be the most rewarding job on this planet but it's one of the most interesting and maybe even one of the most important. They asked an accountant, a mathematician, and an actuary what 2+2 was. The accountant said 4, the mathematician said it depends, and the actuary said, "What do you want it to be?" Yeah, but Sandra Bullock gets to make up for the humiliation and low pay of her job by being married to Jesse James, the man of many amusing tattoos (http://westcoastchoppers.com/). What about the joyful nudes? They seem to have a pretty fun job. I think you misunderstand what it means to be an actor with the comment about 'top-level salary'. Usually an actor is defined as someone with a union ticket (it's 'Equity' here in Australia). Most of them are tending bar (resting) at any given time. Most had a decent acting job once and never got another good one. The average wage from acting here, I once saw, was tiny. A few thousand a year. Sandra Bullock - fine - but there aren't many who earn a real wage from the job. I had a friend who held a long-running minor role in a high scale drama. It paid for her house and a nice lifestyle. When it closed, it was back to bar work and there were no more roles apart from a few commercials and shopping centre promotions. "Didn't you used to be..." She retrained as a lawyer - damn good one too. "The reason that most photojournalists put up with the low pay and difficult circumstances is that they are a amazed they are allowed to do what they do." Have none of you heard the Derek and Clive take on the worst job? Hmmmmm. When we moved to Southern California 7 years ago, we were amused at all the "sign twirlers" you saw on street corners. These "advertising types" held signs for housing developments, tax services, retail establishments, etc. The good ones would dance and twirl the signs enthusiastically to the music they listened to on their iPods. Some were young kids, some down-and-out types and some were dressed in various costumes: clowns, pirates, etc. But the best was the young, attractive lady twirler here in my small town advertising a newly-opened tattoo parlor. She was quite enthusiastic and showed off her tattoos (and most everything else) well enough to stop traffic. And she looked like she was enjoying her job! you can find out how they came up with the numbers by reading the article. It's all there. "I bet Mr.Stobblehouse's job ranks pretty high and the job satisfaction scale, yeah?" It's a tough life: basically, for a living I look at pictures of pretty ladies in the buff (the ladies). But heck, I'm my own boss, and I can take long lunches when I want. Do you make a good cappuccino? I blogged this post, mainly because of the many excellent comments under it. Mike, I'm not sure I see why it would be bad taste to make that Camera-of-the-Year post after the Turnley post. They are just very different aspects of the hobby, not antithetical to one another. I think the most value of working when you're young is that it gets you used to it. It must be an awful shock to start working cold, as an adult. A photograph of that sandwich-board man has lasted long enough to enter the permanent memory of the internet. Sadly, Lindys Kosher Restaurant of 1952 is now the New Great Indian Restaurant. The marketing long outlived the product, thanks to the transient interest of Thurston Hopkins, photojournalist. I'd never heard of Thurston Hopkins before finding that picture. I've had a nice little trip up a photographic tributary exploring who he is and looking at some of his work. He's really very good--at least his work suits my taste. I'm glad to know of him. Ime impressed. Is there nothing you dont know? Their ranking seems weirdly idiosyncratic. But I've been a software engineer basically my entire working life (starting when I was 15; and I got my first SLR camera with my first three months' paychecks), and I do still love it. The best career advice I ever got (not, alas, that I have followed it to the letter) was to figure out what you loved and become better at it than anyone else because someone would then pay you to do it. Q. What's the difference between a freelance photographer and a large pepperoni pizza? Well, actually, right-handed batters hit to left field more often than right, which is why you put your weakest outfielder in right field. But that's just a quibble.